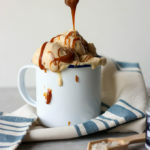 No churn and 5 ingredients, this salted caramel no churn ice cream is your homemade ice cream dreams come true! A creamy vanilla bean base, combined with swirls of caramel and a subtle vanilla salt flavour. Easy to make, and perfect for any time of the year! Oh my gosh! You guys this would have to be on of my old time favourite recipes on THCK! 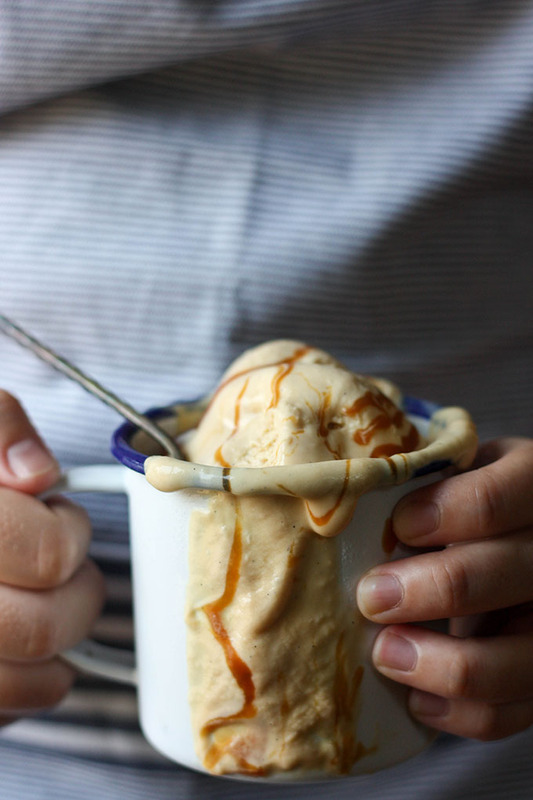 Salted caramel no churn ice cream aka ‘crack ice cream’. Yep, crack ice cream it’s THAT good! I have a friend that came over one day for dinner with her boyfriend, and her boyfriend wasn’t a huge ice cream fan. If he did eat ice cream, he only ever ate vanilla. Well let me tell you, he was hooked! He took one bite, looked at me and was like ‘holy hell, that is damn good ice cream’! And subsequently now demands it when he comes over! I love making no churn ice cream at home because it is SO, SO easy and requires just 5 simple ingredients. I don’t own an ice cream maker (yet – still hinting at Adam to buy me the attachment!) but love making my own homemade ice cream, which is why no churn ice cream is such a good option! What exactly is no churn ice cream? As the name suggests, no churn ice cream is basically ice cream that is made not using a traditional method of churning. As this is the case, no churn ice cream is not made from a traditional custard base of milk and eggs. Instead, it is made using whipped cream and condensed milk. I don’t know the science behind it, but apparently, the high sugar levels in the condensed milk means it doesn’t get all chunky and frosty. You end up with a super silky smooth mixture that requires very minimal effort. How do you make no churn ice cream? This is why I love making no churn ice cream. It is so darn simple. You start by whipping heaving cream, adding your flavours, then fold the cream into the condensed milk, folding until it’s smooth. For this recipe, in particular, I stir the vanilla bean paste through the condensed milk first, then fold in the caramel after I fold in the whipped cream. I then transfer it to an airtight container and serve with a little extra drizzled caramel at the end! How do you store ice cream? There are few simple methods for this. My go-to approach is my Tovolo ice cream tub. It’s an air-tight pint-size tub that is perfect for storing homemade ice cream. I got mine from a local Kitchenware store in Portland and it has been absolutely amazing! If you don’t have an air-tight container, my other option is to pour the ice cream mixture into a loaf pan lined with parchment/baking paper. Then folding down the sides to protect the top, and wrapping in a layer of plastic wrap, then aluminium foil to keep it for crystalising. The vanilla – I use real vanilla bean for this recipe as I believe it enhances the flavour way more than vanilla extract, and I love that you can see the vanilla bean flecks in the ice cream. The caramel – I tend to use store bought caramel, purely because making your own homemade caramel adds a lot more time to cooking and preparation. If you do make your own caramel though, it needs to be fully cooled to room temperature. If it is too hot, it will simply harden quickly when mixed with the heavy cream and won’t disperse through the ice cream fully. 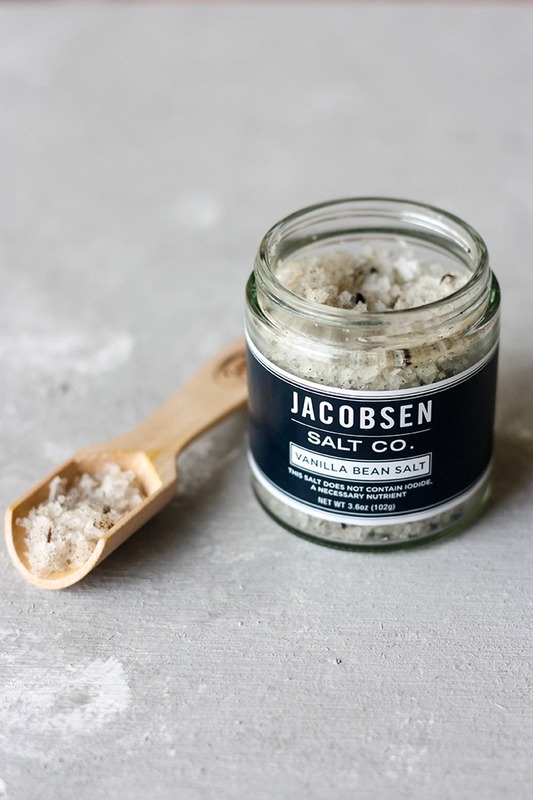 The salt – I’ve spoken about this before, but I love Jacobsen’s vanilla bean salt. If you’re in the Portland area and can get your hands on it, highly recommend it just to add an extra wow element to the ice cream. If not, regular sea salt is totally fine too! The cream – you’ll want to use cold, heavy whipping cream and beat until stiff peaks form (without curdling it). The process – the most important step in making this no churn ice cream, is the folding. You’ll need to soften the condensed milk beforehand by folding just a small amount of the cream into the condensed milk before adding the rest of the whipped cream. You want your mixture to be silky smooth, without overfolding it. This recipe is best made the night before so that it has enough time to fully freeze in the freezer. I love this recipe for that reason, it’s a leave and forget recipe! It’s perfect if you’re having guests over and want a simple, but elegant dessert! Serve in waffle cones, or with fresh fruit and you’ve got yourself a perfect little dessert with minimal effort! Hope you’re having a wonderful Thursday friend’s, next time we speak I’ll be kicking back in London!! Um hello? No churn ice cream is happening! A beautiful, creamy vanilla ice cream with swirls of caramel and pops of saltiness from the vanilla bean salt. And only 5 ingredients! Using a hand-held mixer or stand mixer, whip cream in a large bowl until stiff peaks form. Place unsweetened condensed milk in a large bowl, and stir through vanilla bean paste. Fold through remaining whipped cream, slowly until there are no lumps. Pour into a lined loaf pan/ice cream tub or glass container with a lid (note 5). Place in freezer for 6+ hours or until ice cream is set. note 1 - vanilla bean paste is easy to find in supermarkets or kitchen stores. It has a more genuine vanilla flavor than vanilla extract or essence. If you can't find it, substitute with 1 teaspoon of vanilla extract and taste to see if more is required. note 2 - if you don't have vanilla bean sea salt, regular sea salt is fine. I used a rather flaky sea salt, so it may need grinding up with your fingers if it is too coarse. Otherwise, standard sea salt from a grinder will work fine. note 3 - adding a tablespoon of cream to the condensed milk softens up the condensed milk enough to make it easier to fold in remaining cream. note 4 - it's important to taste test as you go. I started with a 1/4 cup of caramel and added 1/2 teaspoon of salt at a time until I was happy with the flavour combination. note 5 - I use a tub specifically for storing ice cream, however in the past I have used a glass Pyrex dish or loaf pan. I lined the top with parchment paper to avoid freezer burn, then wrapped it tightly in plastic wrap before placing in the freezer. Alternatively, use a glass container with a lid. Dyyyyyying over this. Georgie, it looks WAY TOO GOOD! Dangerous good! And you deserve all the ice cream after the busy month you’ve had :). Have a great weekend, my friend! Mmm. I love salted caramel drizzles…over a number of foods, including ice cream:) That flavored salts places sounds pretty awesome! Jacobsens is awesome, their salts rock! How good is drizzle!!! Ooooohemgee!! This ice cream is EVERYTHING to me. I’m a salted caramel FANATIC. Combine that with no-churn, vanilla-bean ice cream!? I think I’m in heaven. This will be going down SOON!! PS – can’t wait to hear about that new pup!! ha ha you make me laugh! I hope you like it when you do make it! it’s SO easy! i just had the problem of impatience waiting for it to set ha ha! have a good weekend Katherine, and you bet you’ll be getting SO many puppy updates! This looks sooooo good !!!! I am literally drooling after seeing the gorgeous pictures! Vanilla bean sea salt is intriguing.. I need to purchase it sooner! thank you Deepika 🙂 the vanilla bean salt is so amazing, such a cool concept! it’s one of my favourite salts! What an easy recipe with a delicious outcome. I usually make my ice cream the traditional way but definitely need to give this recipe a try. it’s great when you don’t have access to a ice cream maker! that’s why I make no churn so often! You had me at “crack ice cream.” Seriously. Salted caramel ice cream is seriously underrated, which is a-okay with me because that means there’s more for me to eat. That salt sounds so interesting, I’ll be on the lookout for it to use in sweets. ha ha ha love it Rae!! 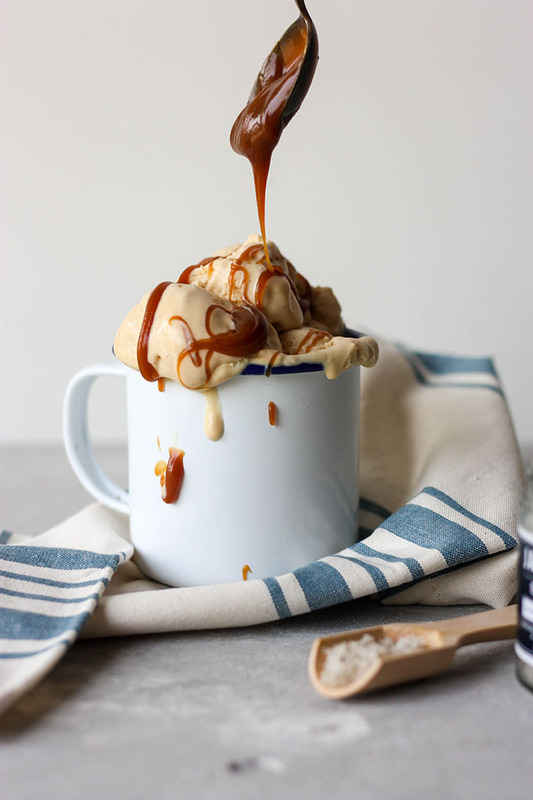 I totally agree about salted caramel being underrated! it is SUCH a great flavour! if you can find the salt, def go for it, it’s amazing! I love the touch of salt in desserts. Your ice cream is so smooth and that caramel is so good, I would eat that cup of ice cream every day! me too! it really cuts out the sweetness of the condensed milk! This Salted Caramel Ice cream is dangerously addictive.. Love love it!! dangerously addictive, I love that!!! it sure is! I’ve always loved no-churn ice creams because they are super silky smooth. 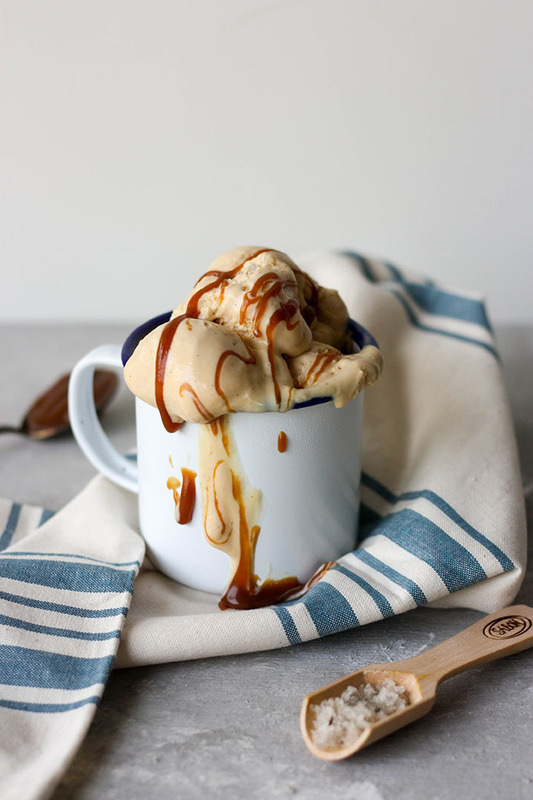 This recipe with salted caramel is so awesome! I could go for another bowl right now. no churn ice cream is the best isn’t it!! i love the texture! i’d be happy to share a bowl with you Mike! I just died a little bit looking at this deeeelicious ice cream. Oh my good, that is the most tempting ice cream photo. Drool worthy! he he thanks Jyothi!!! you’re sweet! Hey! Fellow blogger here. I Just wanted to tell you that your feature photo is probably the most beautiful photo I have ever seen. I mean the fact that I love caramel might have a small part to play… either way, ?? It’s amazing!